On the second night in Denver, after the busyness of a full day of the conference, my sweet husband and I snuggled up in bed with his laptop. He had stashed a movie with which to surprise me. It was a movie he'd seen on an airplane a few months ago. I remember him coming home and declaring that he'd just seen the most perfect movie for me. My children all found this quite amusing since I don't like movies. It is unimportant why I don't like movies--and I'm not quite sure I've figured it out--but my definite bias against movies made his claim to have found the "perfect" movie all the more preposterous. Oh, how I adore Miss Potter! 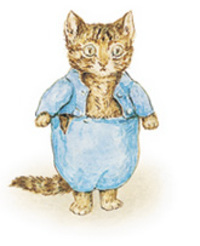 I loved Beatrix Potter before the movie. I loved her art, her delightful turn of phrase, her obvious respect for children. I'd read biographies and played with websites and even done an extensive unit study that was written with Melissa Wiley. But this movie inspired something different altogether. The movie inspired me. I wanted to develop an adult relationship with Miss Potter. I went to sleep that night and dreamed in watercolor. And as soon as it was over, Nicholas headed up the back stairs. "Where are you going, Nickle-pie?" "I have to write a story about animals and I have to paint pictures to go with it and I have to have it made into real books. And I have to start now!" The conversation had begun. One by one, children asked at different times for more of the story of Miss Potter. How much land did she end up buying? Did she have children? How many books has she sold? Who makes decisions about her books now? We were delighted to extend our movie experience with a gem of a journal. 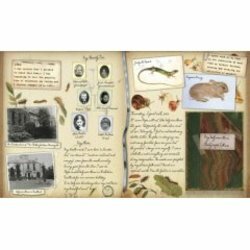 Beatrix Potter: A Journal is a heavy, substantial book with period writing taken from Beatrix Potter's own diaries and journals. There are photographs and sketches and watercolors and scrapbook memorabilia all beautifully bound into a lovely hard book. It's perfect for perusing, setting aside, and coming back to again and again. My children have spent hours with this book. It's the ideal book for strewing casually on the living room table right after the movie has been watched. Since this is my rabbit trail and I have this intense need to know, I'm deep into Beatrix Potter: A Life in Nature and I'm already sure that Miss Potter will have a profound impact on my approach to education once again. 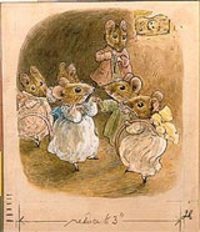 The book captures Beatrix Potter the author and illustrator and the naturalist and conservationist. She had a passion for a place and she was a close observer and a gifted recorder. That is what I want for my children: passion, attention, and the careful stewardship of their gifts. Why, Beatrix Potter is a curriculum;-)! My friend Leah, who is an extraordinary librarian (I highly recommend that everyone should have a dear friend who happens to be a librarian), recommended to me the The Cottage Tales of Beatrix Potter by Susan Wittig Albert . 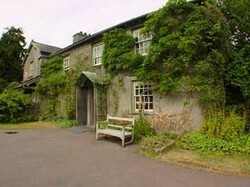 The Cottage Tales are a series of mystery stories in which Beatrix Potter is the protagonist. Susan Wittig Albert has done extensive research and befriended Miss Potter in order to write as faithfully as possible. The stories are easy, delightful read alouds that capture the attention of both boys and girls, particularly those who finish watching the movie and just want to know more--even if that more is fiction steeped in fact. These are available at audible.com--can you guess what we will be listening to on our next road trip? And what is a Beatrix Potter rabbit trail without a tea party? Mrs. Albert plans one for us and lay it out in lovely detail, complete with decoration suggestions and recipes at the Cottage Tales website. Dear friend, you might want to brew yourself a cup of tea before you begin to click around here. Oh, and before we leave Mrs. Albert, here's the ultimate librarian tip: she and her husband also wrote the China Bayles mystery series. And at that website, we discover the "herbal" mysteries, that is mysteries solved by China Bayles, lawyer-turned-herbalist, who is quite the sleuth. Each mystery features an herb and lots of herbal lore and information is woven into the story. And, with all good herb stories, there, are of course, more recipes. (scroll down to the recipe index) and another sweet tea page (click on Tea Parties for a whole year's worth of themed tea parties). 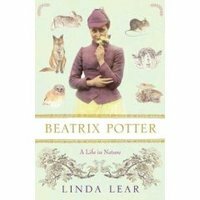 Note: I recognize that I have now left Beatrix Potter entirely but that's the stuff of great rabbit trails!. Sigh. So there you go: a warm, wonderful movie that makes one want to wrap her shawl around her (if one had a shawl) and go for a walk around a lake--and then to come home again and paint beautiful pictures for and with children!